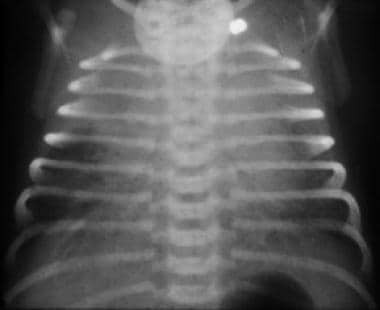 Transient tachypnea of the newborn (TTN) is a self-limited disease commonly seen in neonates throughout the world and is encountered by all physicians who take care of newborn infants. Infants with transient tachypnea of the newborn present within the first few hours of life with tachypnea and other signs of respiratory distress, increased oxygen requirement, and ABGs that do not reflect carbon dioxide retention. When managing transient tachypnea of the newborn, it is imminent to observe for development of respiratory fatigue and signs of clinical deterioration that may suggest some other diagnoses. See the image below. A supine anteroposterior chest radiograph of an infant with transient tachypnea of the newborn (TTN). Note the reticular appearance of the film with mild cardiomegaly and obvious interstitial fluid. Noninfectious acute respiratory disease develops in approximately 1% of all newborn infants and results in admission to a critical care unit. Transient tachypnea of the newborn is the result of a delay in clearance of fetal lung liquid. In the past, respiratory distress was thought to be a problem of relative surfactant deficiency but is now characterized by an airspace-fluid burden secondary to the inability to absorb fetal lung liquid. Fetal lung fluid clears by 35% a few days prior to birth, owing to changes in the ENaC; by around 30% during active labor owing to mechanical transpulmonary forces and catecholamine surge; and around 35% is cleared postnatally during active crying and breathing. An infant born by cesarean delivery is at risk of having excessive pulmonary fluid as a result of not having experienced all of the stages of labor and subsequent lack of appropriate catecholamine surge, which results in low release of counter-regulatory hormones at delivery. The result is alveoli with retained fluid that inhibit gas exchange. Approximately 1% of infants have some form of respiratory distress that is not associated with infection. Respiratory distress includes both RDS (ie, hyaline membrane disease) and transient tachypnea of the newborn. Of this 1%, approximately 33-50% have transient tachypnea of the newborn. Transient tachypnea of the newborn is generally a self-resolving disorder with excellent prognosis. It frequently resolves over a 24-hour to 72-hour period. However, this condition has been associated with subsequent respiratory morbidity, with a significantly increased risk of a wheezing disorder in childhood. Male neonates are more affected than females. Clinically, transient tachypnea of the newborn presents as respiratory distress in full-term or near-term infants. Hooper SB, Siew ML, Kitchen MJ, te Pas AB. Establishing functional residual capacity in the non-breathing infant. Semin Fetal Neonatal Med. 2013 Dec. 18(6):336-43. [Medline]. Venkatesh VC, Katzberg HD. Glucocorticoid regulation of epithelial sodium channel genes in human fetal lung. Am J Physiol. 1997 Jul. 273(1 Pt 1):L227-33. [Medline]. Hooper SB, Wallace MJ, Harding R. Amiloride blocks the inhibition of fetal lung liquid secretion caused by AVP but not by asphyxia. J Appl Physiol. Jan 1993. 74(1):111-5. Olver RE, Ramsden CA, Strang LB, Walters DV. The role of amiloride-blockable sodium transport in adrenaline-induced lung liquid reabsorption in the fetal lamb. J Physiol. 1986 Jul. 376:321-40. [Medline]. Machado LU, Fiori HH, Baldisserotto M, Ramos Garcia PC, Vieira AC, Fiori RM. Surfactant deficiency in transient tachypnea of the newborn. J Pediatr. 2011 Nov. 159(5):750-4. [Medline]. Kasap B, Duman N, Ozer E, Tatli M, Kumral A, Ozkan H. Transient tachypnea of the newborn: predictive factor for prolonged tachypnea. Pediatr Int. 2008 Feb. 50(1):81-4. [Medline]. Silasi M, Coonrod DV, Kim M, Drachman D. Transient tachypnea of the newborn: is labor prior to cesarean delivery protective?. Am J Perinatol. 2010 Nov. 27(10):797-802. [Medline]. Milner AD, Saunders RA, Hopkin IE. Effects of delivery by caesarean section on lung mechanics and lung volume in the human neonate. Arch Dis Child. 1978 Jul. 53(7):545-8. [Medline]. Olver RE, Ramsden CA, Strang LB. Adrenaline-induced changes in net lung liquid volume flow across the pulmonary epithelium of the fetal lamb: evidence for active sodium transport. J Physiol. 1981. 319:38-39. Brown MJ, Olver RE, Ramsden CA, Strang LB, Walters DV. Effects of adrenaline and of spontaneous labour on the secretion and absorption of lung liquid in the fetal lamb. J Physiol. 1983 Nov. 344:137-52. [Medline]. Demissie K, Marcella SW, Breckenridge MB, Rhoads GG. Maternal asthma and transient tachypnea of the newborn. Pediatrics. 1998 Jul. 102(1 Pt 1):84-90. [Medline]. Schatz M, Zeiger RS, Hoffman CP, Saunders BS, Harden KM, Forsythe AB. Increased transient tachypnea of the newborn in infants of asthmatic mothers. Am J Dis Child. 1991 Feb. 145(2):156-8. [Medline]. Derbent A, Tatli MM, Duran M, Tonbul A, Kafali H, Akyol M. Transient tachypnea of the newborn: effects of labor and delivery type in term and preterm pregnancies. Arch Gynecol Obstet. 2011 May. 283(5):947-51. [Medline]. Tutdibi E, Gries K, Bücheler M, Misselwitz B, Schlosser RL, Gortner L. Impact of labor on outcomes in transient tachypnea of the newborn: population-based study. Pediatrics. 2010 Mar. 125(3):e577-83. [Medline]. Copetti R, Cattarossi L. The 'double lung point': an ultrasound sign diagnostic of transient tachypnea of the newborn. Neonatology. 2007. 91(3):203-9. [Medline]. Kao B, Stewart de Ramirez SA, Belfort MB, Hansen A. Inhaled epinephrine for the treatment of transient tachypnea of the newborn. J Perinatol. 2008 Mar. 28(3):205-10. [Medline]. Lewis V, Whitelaw A. Furosemide for transient tachypnea of the newborn. Cochrane Database Syst Rev. 2002. (1):CD003064. [Medline]. Aslan E, Tutdibi E, Martens S, Han Y, Monz D, Gortner L. Transient tachypnea of the newborn (TTN): a role for polymorphisms in the beta-adrenergic receptor (ADRB) encoding genes?. Acta Paediatr. 2008 Oct. 97(10):1346-50. [Medline]. Kim MJ, Yoo JH, Jung JA, Byun SY. The effects of inhaled albuterol in transient tachypnea of the newborn. Allergy Asthma Immunol Res. 2014 Mar. 6(2):126-30. [Medline]. Ozkiraz S, Gokmen Z, Boke SB, Kilicdag H, Ozel D, Sert A. Lactate and lactate dehydrogenase in predicting the severity of transient tachypnea of the newborn. J Matern Fetal Neonatal Med. 2013 Aug. 26(12):1245-8. [Medline]. Aydemir O, Aydemir C, Sarikabadayi YU, Altug N, Erdeve O, Uras N. The role of plasma N-terminal pro-B-type natriuretic peptide in predicting the severity of transient tachypnea of the newborn. Early Hum Dev. 2012 May. 88(5):315-9. [Medline]. Weintraub AS, Cadet CT, Perez R, DeLorenzo E, Holzman IR, Stroustrup A. Antibiotic use in newborns with transient tachypnea of the newborn. Neonatology. 2013. 103(3):235-40. [Medline]. Salama H, Abughalwa M, Taha S, Sharaf N, Mansour A. Transient tachypnea of the newborn: Is empiric antimicrobial therapy needed?. J Neonatal Perinatal Med. 2013. 6(3):237-41. [Medline]. Hein HA, Ely JW, Lofgren MA. Neonatal respiratory distress in the community hospital: when to transport, when to keep. J Fam Pract. 1998 Apr. 46(4):284-9. [Medline]. Keszler M, Carbone MT, Cox C, Schumacher RE. Severe respiratory failure after elective repeat cesarean delivery: a potentially preventable condition leading to extracorporeal membrane oxygenation. Pediatrics. 1992 Apr. 89(4 Pt 1):670-2. [Medline]. Liem JJ, Huq SI, Ekuma O, Becker AB, Kozyrskyj AL. Transient tachypnea of the newborn may be an early clinical manifestation of wheezing symptoms. J Pediatr. 2007 Jul. 151(1):29-33. [Medline]. Birnkrant DJ, Picone C, Markowitz W, El Khwad M, Shen WH, Tafari N. Association of transient tachypnea of the newborn and childhood asthma. Pediatr Pulmonol. 2006 Oct. 41(10):978-84. [Medline].